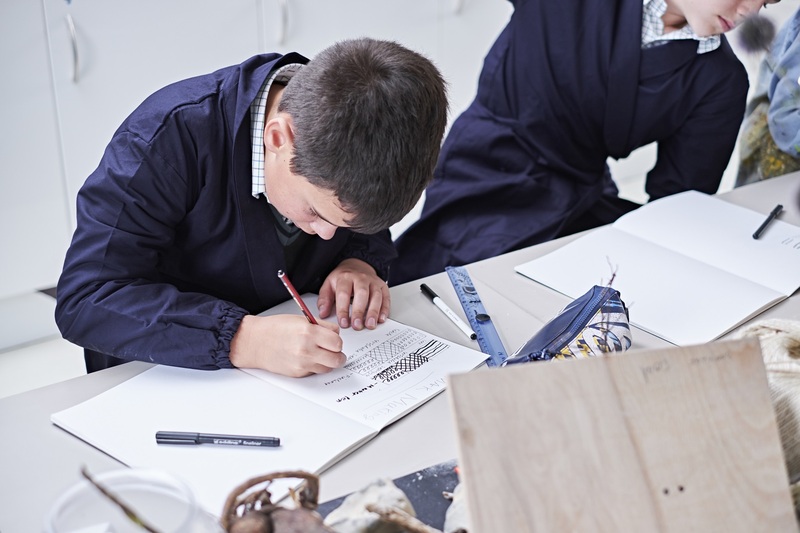 Over the next six months, Stephen Perse students will be taking part in the Frequencies project, an international collaboration created by the Colombian-born artist Oscar Murillo. The project consists of temporarily attaching canvas to the top of classroom desks to capture the drawings, writing and doodles of students over a set period of time. The students are not given any materials or instruction as to what they can and cannot do, allowing the canvas to capture their daily thoughts and experiences. Murillo is interested in not only documenting the cultural and social differences that occur worldwide, but also the similarities. So far, the project has taken place in over 300 schools in 31 countries worldwide. His archive currently has approximately 15,000 individual canvases, and approximately 5,000 more in development. How will it work at the Foundation? The project will be installed on Thursday 15 and Friday 16 November at the Junior School, the Senior School and the 6th Form College, followed by Friday 23 November at Dame Bradbury's. The canvases will be installed in a variety of classrooms and will remain for around six months - students will be participating as soon as the canvases are installed. What will happen to the canvases? These canvases are collected together at the end of the six-month period by Oscar Murillo, contributing to his ongoing research and forming part of a growing international archive. Selections of canvases are also exhibited worldwide, and we will keep you updated if and when any Stephen Perse canvases are exhibited. According to the Frequencies project organisers, students quite quickly forget the canvases are there. Teachers can go about teaching as normal, and will of course be free to ask students to stop drawing and concentrate on the lesson as/when they usually would. The Frequencies project team have found that there are usually a few minutes of getting settled at the beginning of lessons when students can find time to draw, this can help them settle in to focus. What are the benefits for our students? Being involved with this project provides a fantastic opportunity for our students to enhance their role as global citizens, and connect their experiences with those of other students participating in the project around the world. It also provides another platform for their creativity, and encourages them to share their ideas, thoughts, opinions and perspectives. It has also been shown that doodling can help to focus the mind by occupying the hands (much as one might doodle on paper whilst on the phone), and the therapeutic implications of being able to express feelings or focus on something outside can be a stress reliever, all of which can contribute to a positive learning environment. We can’t wait to see how this project evolves! This map displays where all the schools involved with the project are located.